Based in Port Washington, Wisconsin, Allen Edmonds creates the quintessential American shoe. They began cultivating their loyal following shortly after they started supplying shoes to the Army and Navy for World War II. This is a brand, rich in history and quality, that over time has become a pillar of American excellence. Allen Edmonds is a brand that we at assembly88 are extremely passionate about, because of their commitment to style, quality, and American manufacturing. Founded in 1922, Allen Edmonds has remained loyal to its “Made in America” roots. While other companies have chosen to move their manufacturing over seas, with the intent of trading quality for profits, Allen Edmonds continues to make the majority of their shoes domestically (98.5% to be exact). In 2003 their chairmen and former CEO, John Stollenwerk, invested 1 million dollars in the company’s Wisconsin manufacturing site, put an end to assembly line manufacturing, and created a work place where employees work in small groups, taking a shoe through the entire completion process. This new manufacturing process reduces the amount of wasted materials, allows for special orders to be met in a timely fashion, and produces higher quality shoes. Before opening assembly88, we sat down and discussed brands that we felt needed to be a part of our shop. Allen Edmonds was among the first names that we agreed upon. 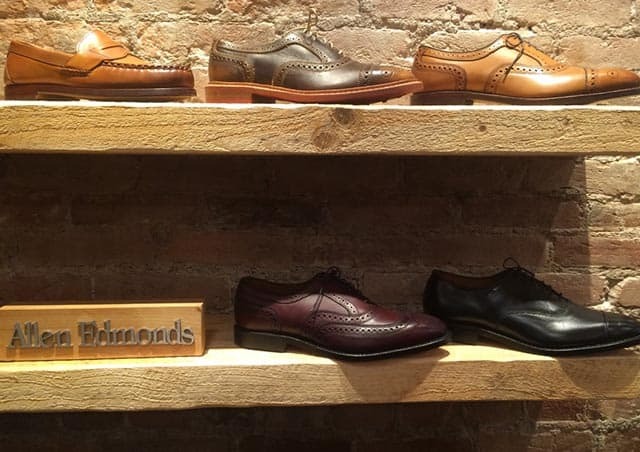 Now, more than five months after our grand opening, we are thrilled to be offering Allen Edmonds shoes in downtown Allentown.